A Depiction of St Ethelburga of York in Stained Glass, Bradford Cathedral. Posted by Mr. B Flaneur | Filed under Church Gazette. The View from Clifford’s Tower looking towards Skeldergate Bridge, York, 27/12/15. 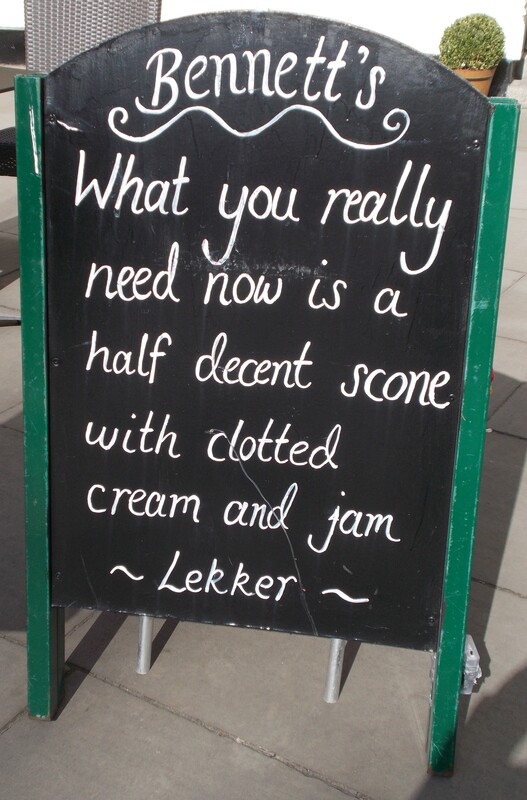 Posted by Mr. B Flaneur in Out and About., Yorkshire. The row of trees, reflected in the flood water, usually mark the bank along the River Ouse. The ground between the trees and Tower Street is usually occupied by a park. Beyond the Skeldergate Bridge the flood waters of the Ouse have joined those of the Fosse. Clifford’s Tower, one of a group of buildings and green spaces that form an area known as York Castle, affords excellent views of York and I should think it has done since the reign of King Henry III. Clifford’s Tower, currently maintained and garrisoned by the staff of English Heritage, seemed to be a popular spot to stand and try and absorb the enormity of the situation. Photo Archive: King’s Staith viewed from Bridge Street, York, 24/07/14. King’s Staith viewed from Bridge Street on a beautiful July day back in 2014. I knew that the “King’s Arms” on King’s Staith had a history of flooding, in fact one Tripadvisor review describes it as “The Iconic Pub That Floods“, but on all my previous visits to York I have been fortunate that the River Ouse hasn’t been in flood, making my visit last Sunday a notable exception. King’s Staith viewed from Bridge Street on Sunday 27th December 2015. My travelling companion assured me that I would be able to keep our appointment in York, despite the various flood warnings, because he had studied the route carefully and I must admit that we travelled as far as the Fishergate Bar, which provides pedestrian access from Paragon Street, through the city wall, into George Street. Then the day started to take a surreal turn, as we were faced with the River Foss, which had burst its banks. The “King’s Arms” public house, King’s Staith, 27th December 2015. Later in the afternoon we reached Bridge Street and stood, with quite a crowd of pedestrians, watching the River Ouse distort a scene I thought I knew. The beer garden of the “King’s Arms”, not to mention most of the ground floor, had disappeared and with it any sense remaining sense of normality. Having said that, from the very same spot on Bridge Street, I could see diners at “The Slug and Lettuce” eating their Sunday lunches in a building that must have had flooded cellars, which leant the afternoon an added, surreal, twist. York is a city I love and I wish all of the city’s residence, students and visitors well at this difficult time. Captain Edmund Blackadder, “Thomas’s of York” Public House, Museum Street, York, 15/08/15. 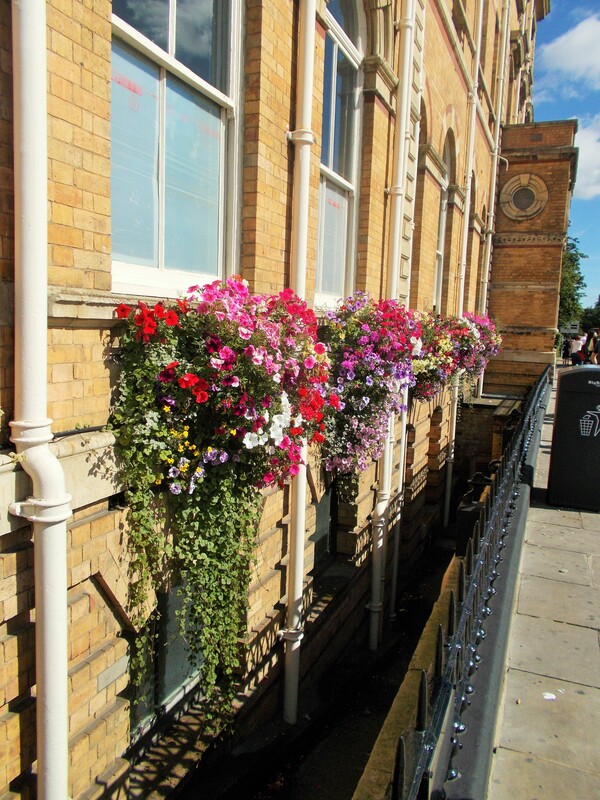 Window Boxes in Bloom, The Royal York Hotel, Station Road, York, 15/08/15. Leaving the train at York is always a feast for the eyes.I usually cross the station using the footbridge, so I can admire one of the great “cathedrals of the Railway Age” [to borrow a phrase a website called “Railway Architecture of North East England“] and take everything in. 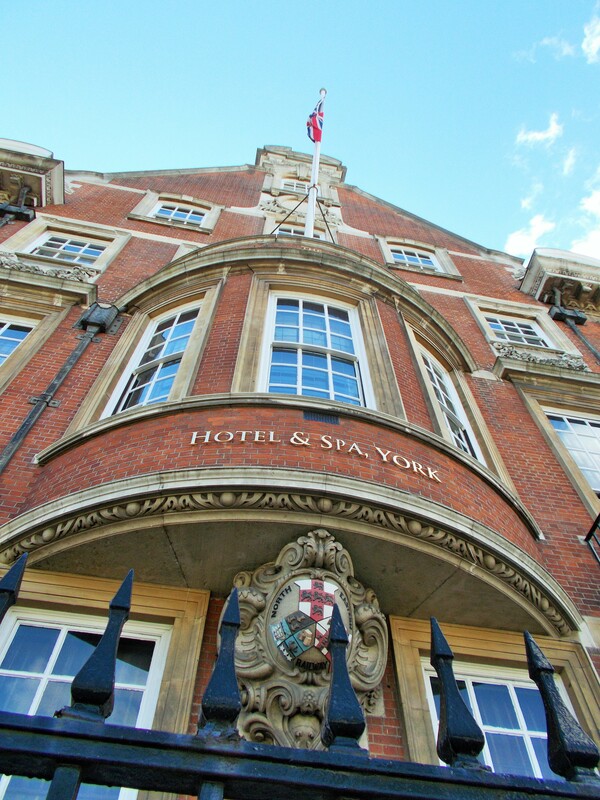 Then I usually turn left when I leave the station, onto Station Road, passed the waiting taxi cabs and face my first York landmark, The Royal York Hotel, a Grade II listed building designed by William Peachey of the North Eastern Railway. 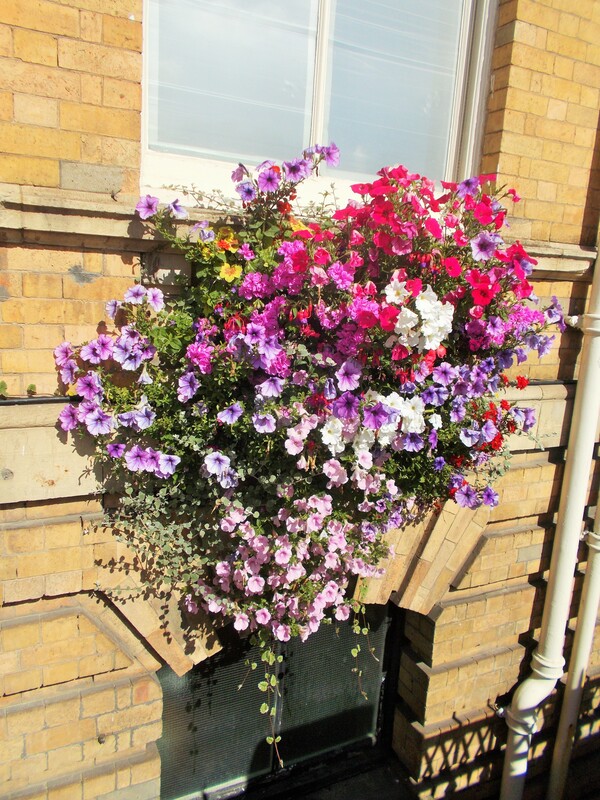 The hotel opened in 1878, a year after the present railway station, and was the flagship hotel for the North Eastern Railway Company’s flagship hotel, according to a certain on-line encyclopaedia. I can’t say I have notice The Royal York Hotel’s window boxes in the past, but they must have looked particularly charming on this particular occasion [either that or I wasn’t rushing passed then in a hurry to get somewhere for once]! The Union flag flying from The Grand Hotel and Spa, Station Rise, York, 15/08/15. Note the badges of the North Eastern Railway under the bay window. 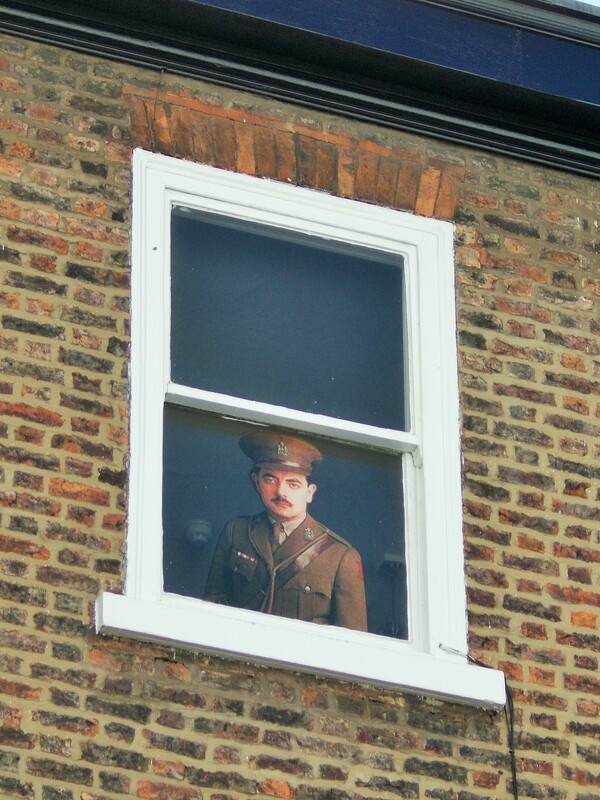 Not all visitors to arrive in York, I’ve noticed recently, head into town, having passed through the historic city walls, having turned into Station Rise; in fact I’m probably in the minority. Station Rise has always been, in my lifetime, home to The North Eastern Railway Memorial, dedicated to the 2236 men of the company who lost their lives in the Great War, buses coming out of George Hudson Street (named after “The Railway King” George Hudson, railway pioneer, Conservative politician, dubious businessman and debtor) and this impressive Edwardian red brick building, which is now The Grand Hotel and Spa. A plaque, a piece of history in itself, informed me that, “This building, now the headquarters of British Rail, Eastern Region, was head office of the North Eastern Railway from 1906“. I think I’m right in saying that York became the headquarters of the Eastern Region when it amalgamated with the North Eastern Region in 1967 and ceased to exist in 1992 [but if you’re an expert in these matters, feel free to correct me], so the plaque was already something of a curiosity when I started to notice the plaque when I was a much younger man than I an today! The badge of the York and North Midland Railway (Top), the badge of the Leeds Northern Railway (left) and the badge of the York Newcastle and Berwick Railway, which formed the North Eastern Railway in 1854. 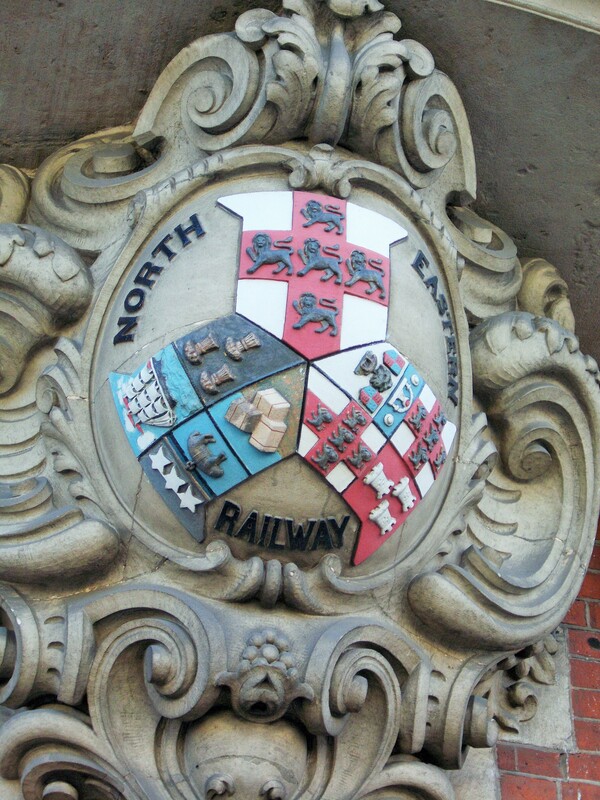 The plaque also describes the different elements of the North Eastern Railway badge, which is one of the most noticeable ornamental details and can just be seen below the bay window in first photograph and in detail above. Scones, Bennett’s Cafe and Bistro, 30-32 High Petergate, York. 24/03/15. Posted by Mr. B Flaneur | Filed under Out and About., Yorkshire. 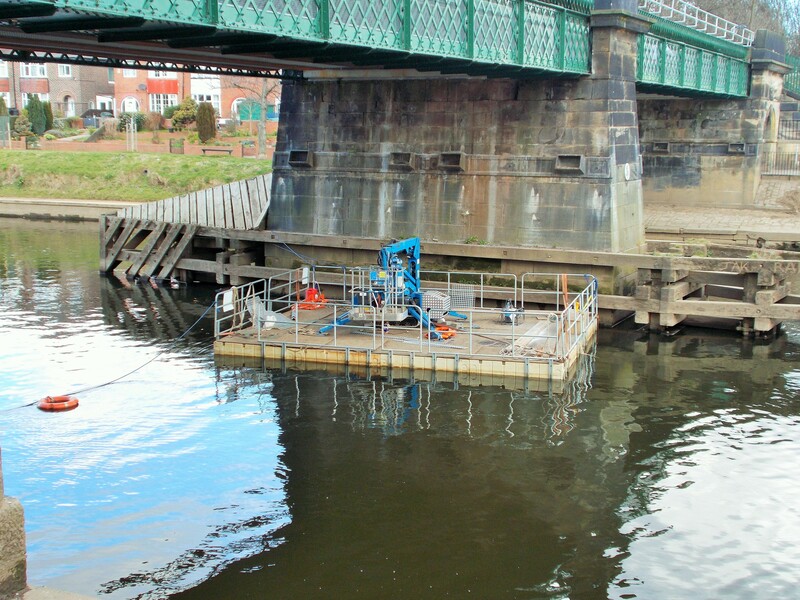 Inspecting The Scarborough Bridge, York, 24/03/15. 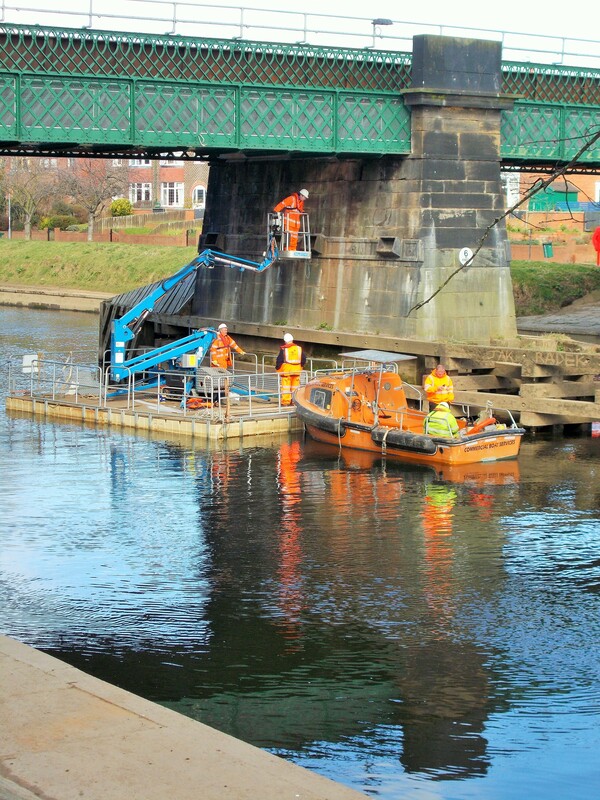 According to Network Rail’s website, the Scarborough Bridge, which carries the railway line from York to Scarborough over the River Ouse, wont need replacing for another 120 years following its six million pound “facelift“, so these chaps must have been inspecting the recently completed work. It looks like a very tricky job! This was the scene when I returned to the stop about an hour later. Do you think they’ve gone home? 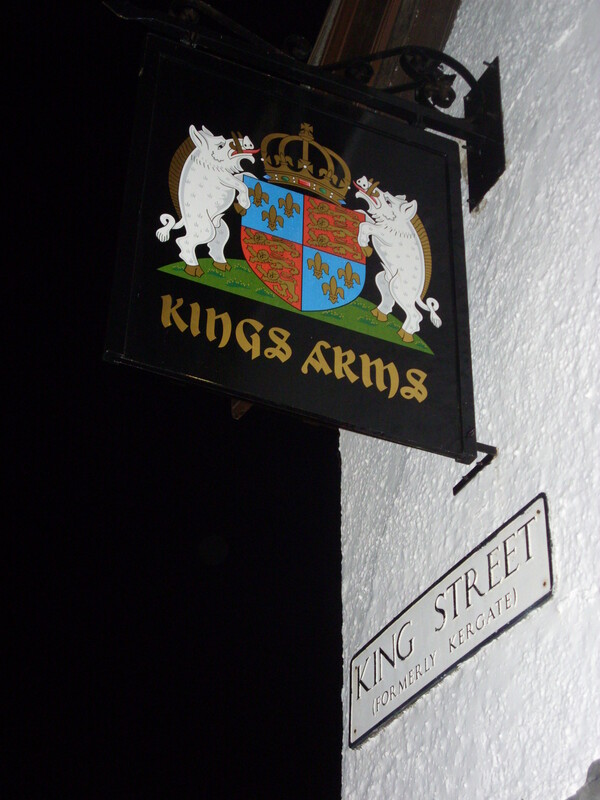 Photo Archive: King Richard III, “Kings Arms” Public House, King’s Staith, York, 2010. 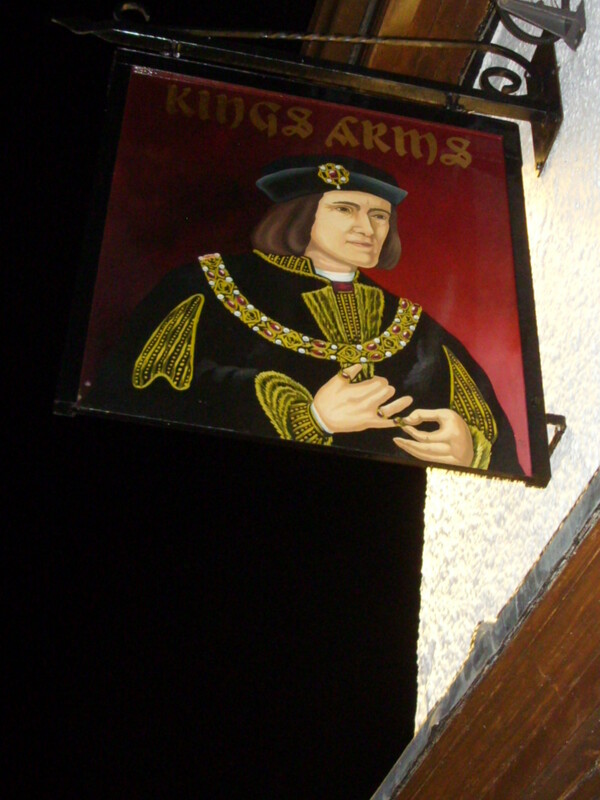 The “Kings Arms” was not the first public house I visited in York that cold November evening back in 2010, but I obviously wasn’t so merry that I didn’t notice this portrait of King Richard III hanging over me; inspired by one of my favourite painting from the National Portrait Gallery in London, by Anon. To quote from the Gallery’s website, “This portrait, in which he appears to be placing a ring on the little finger of his right hand, has been seen by some as evidence of his cruel nature and by others as evidence of his humanity”, so you can read into it what you like! As well the portrait the pub also displays the Arms of Richard III, which include his personal heraldic device, the white boar, flanking the Plantagenet coat-of-arms. A certain on-line encyclopaedia informs me that a complete boar in heraldry, as opposed to just the head, might represent the courage and fierceness the boar displays, but I haven’t had much experience of boars in the wild [or in captivity, for that matter]. The Richard III Society, which promotes research into King Richard III related matters, still uses the white boar on some of its heraldic devices and logos.